Dark, humorless and, worst of all, dramatically dreary, AMC’s Low Winter Sun sets up shop Sunday in hopes that Breaking Bad fans will buy it wholesale. That doesn’t seem likely. This adaptation of a same-named 2006 British miniseries marches rather stiffly to the same-old/same-old dirty cop drumbeat. What’s new under the sun? Well, it certainly doesn’t shine on this portrait of a badly scarred Detroit and its equally dour police force. AMC’s promotional tagline is “Good Man. Cop. Killer.” Which just as easily could be “Sigh. Been There. Done That. Too Many Times Already.” The acting is willing but the premise is wilted. 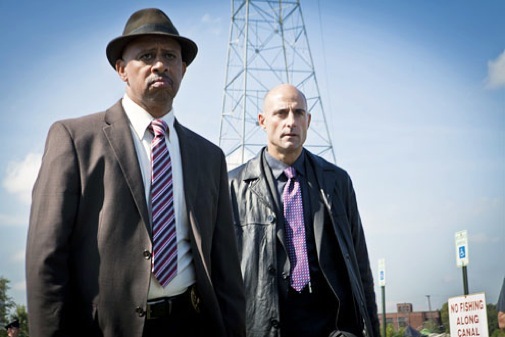 Native Londoners Mark Strong (reprising his role from the original) and Lennie James front the cast as detectives Frank Agnew and Joe Geddes. In the premiere episode’s opening sequence, they work up the gumption to murder a badly corrupted cop and then cover it up. Low Winter Sun, set for 10 episodes in Season 1, regularly moves back and forth between a fractious cop shop and a group of second tier drug- and prostitute-pushers intent on movin’ on up. Maya Callis (Sprague Grayden) otherwise camouflages her illicit activities by running a bar while husband Damon (James Ransone) provides the muscle. Tying these stories together, although not all that well in the first two episodes sent for review, is the aforementioned murder of the crooked cop, whom Damon had bought. Murky jerky. AMC has carved out a rep for distinctive, high-quality drama, beginning with Mad Men, continuing with Breaking Bad and achieving new heights -- ratings-wise at least -- with its most popular series by far, The Walking Dead. But BB is ending after its final eight-episode arc and Mad Men will close shop next year. Based on the first two episodes, Low Winter Sun is not nearly in the same league as any of them. Low on initial appeal and likewise short on originality, it’s a bleak ’n’ grim undertaking that just doesn’t seem built for the long haul.